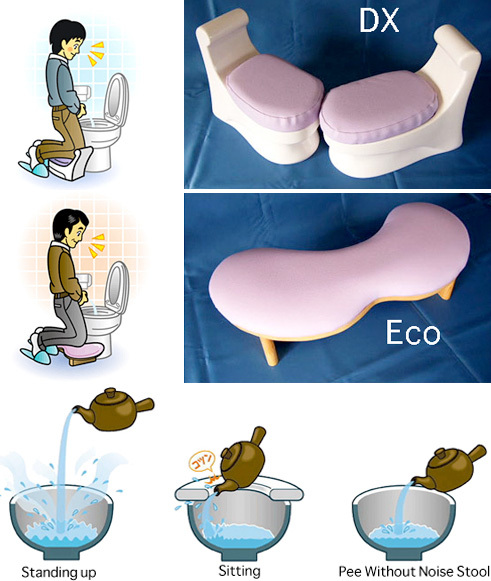 Pee Without Noise Stool – Yeah, Apparently This Is Real | OhGizmo! If you’re subconscious self-conscious (sorry, still feeling the effects of CES) about making too much noise when you’re going you-know-what in the you-know-where, you can now get yourself a special stool because apparently just sitting isn’t manly enough. Based on exhaustive research involving a tea pot and a toilet bowl, the Pee Without Noise Stool puts you closer to the, um, action, keeping unwanted sounds to a minimum. And what will you be paying to save face the next time you’re in the loo? How about $76 for a wooden ‘Eco’ model or $98 for a ‘DX’ model which is made of polyurethane instead. Cant we just aim the stream of pee at the slope of the bowl to break the fall of the pee? I know I do that at night when I dont want to wake up the gf. In a small bathroom that device takes up too much room. BESIDES, why not just sit down if that worried about the noise????? I'm tall enough I can kneel on the ground and my ding dong is still 4″ above the rim. I do this at night when our baby girl just falls asleep because I pee loud from the 6' 5″ height. LMAO I thought about getting a kneeling pad for gardening to soften the tile floor. Is that like the noise maker for women? Some people feel odd about things like that. I was very surprised to find out that this was not a Chinese invention. Unbelievable the things they will create. Look for cheap Chinese knockoffs in the coming weeks.